What a wonderful Christmas Day I had. I was with Heather and family on Christmas for the first time since 2007 which made it very special. The last time we were together was Sam’s first Christmas when Uncle Justin, Auntie Jo, Mark, and I traveled to Boothbay, Maine, to spent Christmas with the Goldstones. Mark and I were last with Justin and family for Christmas in 2014 and spent last year with my sister and brother-in-law in Nashville. I really missed all of them today, but thoroughly enjoyed being with the three Goldpebbles for the very first time. We were up at the crack of dawn and the boys wanted to dig into their stockings first. The amount of excitement over just a pencil was quite refreshing. 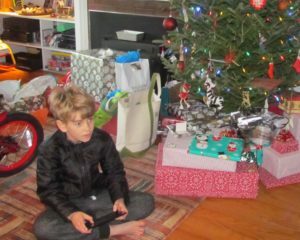 But when they opened their Santa presents the real excitement took over—a bicycle for Ollie, a drone for Sam, and a remote-controlled motorbike with a built-in camera for Jonah. The boys were over the top, but unfortunately the euphoria didn’t last long. 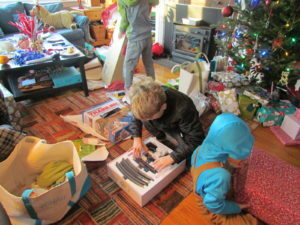 Both Sam and Jonah had technical difficulties with their gifts. 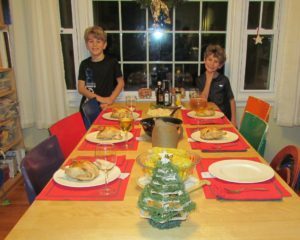 There was a bit of a meltdown, but they bounced back and managed to have a good day even without their gifts from Santa. This is the second year in a row Heather has had to return Santa’s electronic gifts to the boys and she is thinking this is a sign that they should not request electronics from Santa again. Those darn elves must not know just how to put together high tech toys! But there were tons of other presents. 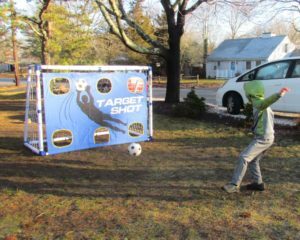 I got Ollie a John Deere remote-controlled train, Sam a beginner’s model train set, and Jonah a soccer goal trainer. All three were big hits. 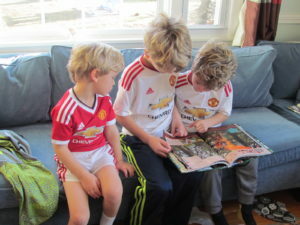 And, of course, there were lots of books and even Manchester, England, soccer shirts for the boys which they wore proudly all day. I got all sorts of goodies, but my red sea glass earrings from Justin, Jo, and kids, and the promise of handmade set of pottery soup bowls from Heather, Jed, and boys were my favorites. The neatest thing about the earrings is that that Justin and Jo know the person who found the red sea glass and the person who made the glass into earrings. The neatest thing about the pottery soup bowls is that I can go see examples and custom order what I want from Heather’s neighbor, Sarah Caruso. Special, personal presents. After opening presents, I got a call from Justin. We did a Skype video call and the little cousins all got to see each other and Ziggy and Coco got to tell me all about their Christmas presents. Coco was holding her present from Santa which was a new puppy, a toy Yorkshire. What a cute little fur ball with his princess mother. 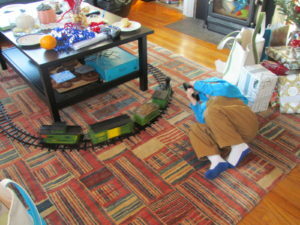 And Ziggy was excited by his robot gift from Santa, the Lego train from me, and the luxurious yard at the new house with lots of green grass. A little later in the afternoon, Justin called again, this time from their new home, and I got a video guided tour via Skype. What a lovely place they have purchased. The house is very large, with four bedrooms and a huge living room and kitchen. 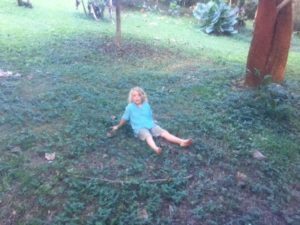 And the two-acre lot is a tropical paradise. 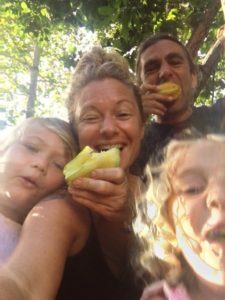 There are lots of banana trees bursting with bananas, mango trees, an avocado tree, a cinnamon tree, a mulberry tree, an ylang ylang tree, and even their own starfruit tree. It was super exciting to talk to Justin, Jo, and kids, and share the wonders of their new home. Mid-afternoon I had to return home to pick up the Rock Cornish hens I had bought to fix for dinner and Heather headed out with the boys to ride their bicycles. Only Ollie was new to a bike, and with training wheels on, he took off like he had been riding forever. 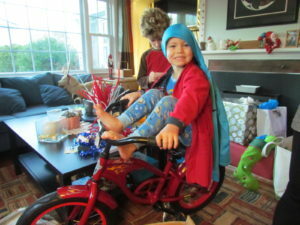 He had never really been on a pedal bike before as he has used a Strider until now. But he made the move with no problem and actually biked for two straight hours. After an hour of riding, the other kids headed home, but Ollie was still at it and Jed had to come take-over for Heather who was freezing by this time. 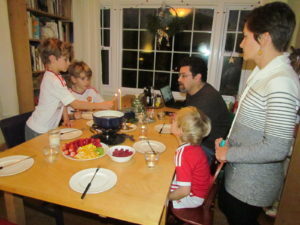 At sundown, after we lit the second Hanukkah candle, we had a decadent treat. 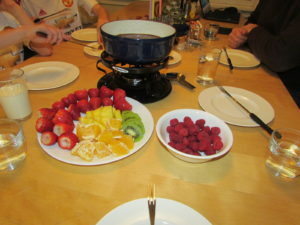 We had chocolate fondue with fresh fruit as dessert before dinner. We dipped pieces of pineapple, strawberry, kiwi, banana, orange, apple, as well as raspberries and Hanukkah sugar cookies in the chocolate in the new fondue pot I got Heather for Christmas. And then the real treat of the day was dinner. We each had our own roasted Rock Cornish game hen cooked with Jed’s special touch, Heather’s delicious kale, corn-on-the-cob, and a Goldstone version of kugel (a classic Jewish pasta dish). The table looked festive and we all really enjoyed the Christmas dinner. Unfortunately, we had to eat without Ollie. 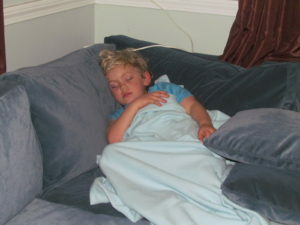 He was so tired after his two-hour bike ride that he literally passed out on the sofa, and there was no getting him up. He’ll just have to have his Cornish hen for lunch tomorrow. My nephew Rex called today, Ed and Lynne Kirwin sent a very nice holiday text message, and I had a nice long phone conversation with my sister Patsy. Thank you to all who are doing their best to keep me happy throughout the holidays. 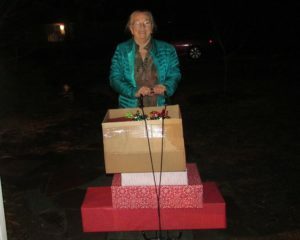 And a special thank you to Heather and Jed for hosting such a special Christmas for Oma. I have one more day with them before they head to Maine on Tuesday morning, so I will go there to visit after going to the gym in the morning. Christmas is over and it is time to get in shape for the New Year! Happy Hanukkah and Merry Christmas to all. Today was a day for melding traditions. 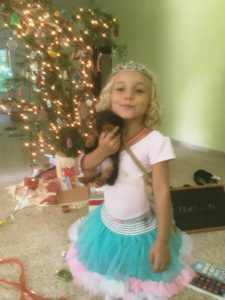 It was the first day of Hanukkah and Christmas Eve, so Heather deemed it Christmukkah. I had an early morning phone call from Mary Ellen and Lee, Mark’s sister and brother-in-law, and then I got things together and headed to Heather and Jed’s. Heather was determined to have a clean house on Christmas morning, so she spent a great deal of her day sweeping and mopping. 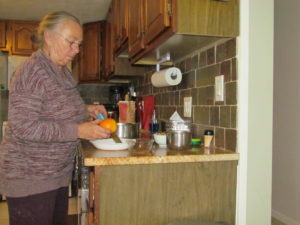 But she also did a lot of food preparation for dinner. I started to pitch in to help, but got a phone call from Kevin and Claire which got me out the work! 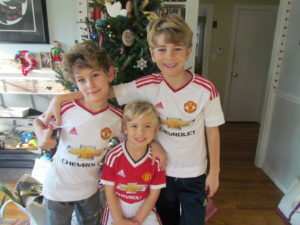 They are in California with Kevin’s family and will be heading to Vancouver to be with Claire’s family after Christmas. It was great to talk to them and we were on the phone long enough to give Heather time to finish her cleaning. Whew, I got out of that work! I then made Hanukkah cut-out cookies with the boys and we made a Hanukkah snack bowl filled with pretzels and gelt (chocolate coins which are a Jewish tradition). While doing that, I got a call from Justin. He and Jo were working like crazy to get their new home ready for Christmas Day. They took possession this morning, cleaned all day, and although they have not moved any furniture in and have no electricity until Monday, they really wanted to have Christmas morning there. So they set up their Soul Pad tent and will sleep in the tent and cook on a camp stove. But they are so happy to finally have their own home that they don’t care, and I am so happy for them. But back to the Goldstones . 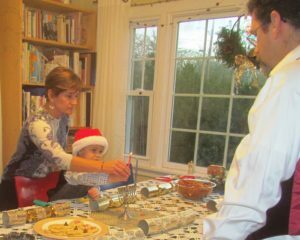 . . we managed to light the first Hanukkah candle just at sundown. Ollie had the honor of lighting the first candle this year and he looked so adorable all dressed in his fancy vest and red Santa hat. After the lighting of the candles, I had to go home to get my Christmas presents for tomorrow morning and get my overnight bag, which left Heather and Jed alone to fix dinner. By the time I got back we had antsy boys as we all waited for the ribeye roast to cook. It took way longer than any directions indicated. Sam got the first serving as he is the meat lover in this family and he immediately said it tasted funny. Heather took a bite and almost choked. The very expensive, grass-fed beef roast that took forever to cook was not edible. What a disappointment for Heather who had worked so hard to prepare a wonderful dinner. Thankfully there was plenty of food without the roast. She had clams and shrimp for appetizers plus deviled eggs I made, and then there were beet and potato latkes and fabulous roasted Brussels sprouts with pine nuts. 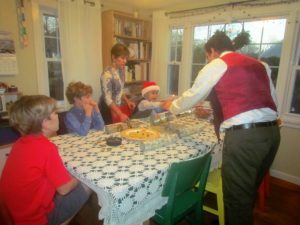 After dinner the boys played with the Super Stadium Baseball Game I got them as a Christmas Eve-Hanukkah present and then we all headed upstairs to read The Night Before Christmas and sing a few Christmas songs. Jonah has a beautiful voice and sang a couple of solos for us. And then the singing ended with Ollie and I singing, “Must Be Santa.” It is his favorite song this year and we have sung it together a few times with him singing parts of the song solo. Heather and Jed had never heard him sing this and they were duly impressed. 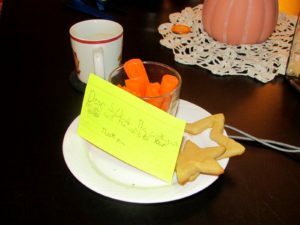 Sam got the treats for Santa and his reindeer ready and set up his camera to video Santa when he appears. This is an almost ten year-old little boy wanting proof that Santa really exists, so trying to catch Santa on video is his creative way of doing this. 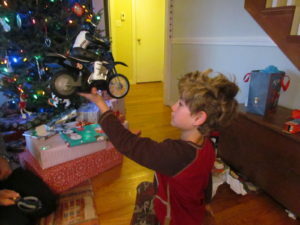 I tried to tell him his battery might not last long enough to catch Santa, but he was insistent on trying. 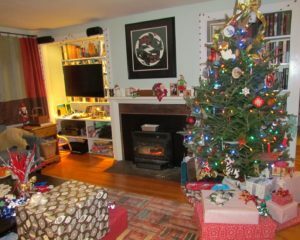 After a couple of hours of wrapping stocking stuffers, the living room is absolutely filled with presents. Add Santa’s gifts and stockings to this, and I think we will have a full morning of opening gifts. Had a great overnight with the Goldpebbles here last night and continued the fun this morning. I will head to their house tomorrow for Christmas Eve and Christmas Day. I love the holiday season but am finding it to be an incredibly difficult time for me this year. I know “this too shall pass” . . . but not easy. Today I baked small loaves of cranberry bread to be given away as Christmas gifts. And I haven’t done anything for weeks that felt so good. I started baking this particular cranberry Christmas loaf in the late 1970’s, but when I moved aboard Windbird in 2003, I left the small baking pans with Heather and have only made the bread a couple of times since. And now, for various reasons, I don’t even eat bread or anything made from wheat flour. But something about reverting to old traditions, the smell of the grated orange peel and the heavy scent of raw honey, made for an absolutely joyful afternoon of baking. My morning was also joyful. The technician from the cable company came early and got the TV working again. Actually, my television and equipment were just fine. The problem was in the wiring coming into the apartment complex. But for now, I’m all set. 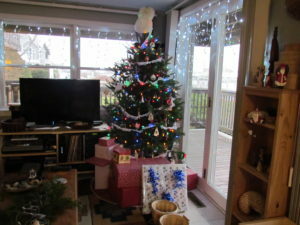 Once he left I moved the Christmas tree back into its little corner and put the living room back in order. 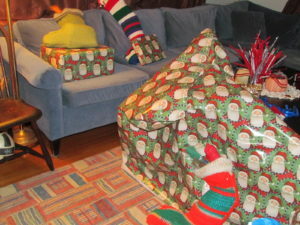 I have all the packages for Heather, Jed, and boys wrapped, so I put them under the tree. 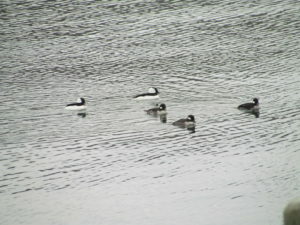 While the Christmas lights and packages brightened the day inside, the little black and white Buffleheads brightened the harbor. These guys come down from Canada for the winter and I love watching them. I then went food shopping once again, this time to find the fresh Rock Cornish game hens for Christmas day. I was prepared to drive to Hyannis to find them, but that wasn’t necessary. I struck out at the first store. They were supposed to get a shipment this morning, but didn’t. The other large supermarket didn’t have any in their meat section either, but I asked a someone to check in the back for me. It took a while, but he came out with a new shipment of eight and I bought six of them. I headed home with the bounty and started baking. I’m not sure the last batch of bread got completely done, but I had to take those little loaves out of the oven and head to East Falmouth to pick Sam and Jonah up from school. And at the last minute, I got a text from Heather asking me to pick her up on my way. She was at an office Christmas party that was on my way, so the two of us picked up the boys. They packed for the overnight and we then headed to my place. Heather was to meet up with Jed here when he delivered Ollie, so while we were waiting, Heather and I packaged up the Christmas loaves. I had a delightful evening with Sam, Jonah, and Ollie, and tomorrow morning we will start another baking frenzy. We are going to make more Christmas cookies. And who knows what else we’ll get into tomorrow. There are three more days until Christmas, so I spent my afternoon scurrying about in grocery stores and doing a little last minute shopping. I will spend Christmas Eve and Christmas Day with Heather and family and I volunteered to do most of the food shopping for our holiday meals. I have one more store run in the morning, and then the food shopping should be done should be done. Xfinity also comes in the morning to try and figure out why I don’t have a cable signal and I want to bake some cranberry bread with the last of the cranberries we harvested from the bogs in Heather and Jed’s neighborhood and honey harvested from Heather’s bee hives. So tomorrow will be a busy one. Heather and Jed both work through Friday, but tomorrow is the last day of school for the boys. I have invited them over for dinner and to spend the night tomorrow night. I only extended the invite late this evening and have not heard back yet as to their reply. But hopefully, Sam, Jonah, and Ollie will come spend tomorrow night and then we will spend part of our day on Friday baking the last of the Christmas cookies. We have already made lots of thumb-print sugar cookies, but we have more to make. On Christmas Eve we will deliver baked Christmas goodies to neighbors and friends. I didn’t mention in last night’s log that Heather and Jed’s furnace developed a major leak last night at the end of solstice celebration. The spraying water in the basement looked a little like a fireworks display! Heather and Jed got the water supply turned off that goes to the furnace which meant they had no hot water in the house and no heat. But they have a very nice wood stove that keeps them cozy in this kind of weather. The furnace repair guys came today and spent the entire day. None of us wants to see the bill for that work before Christmas, but tonight they do have heat and hot water once again. Seems like there is no end to the drama around here! At 5:44 am, the shortest day of the year for those of us who live north of the equator will be upon us. For centuries, people have celebrated this special day which marks a change in the seasons. This is a celebration shared by everyone on earth. There are not many things all of us can celebrate together, so that makes solstice very special. 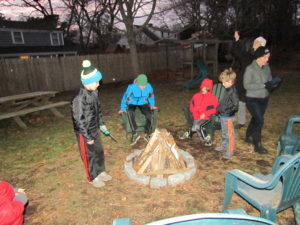 Heather and Jed have a tradition of celebrating winter solstice, so this evening just after sunset, we ushered in the shortest day and the longest night with friends from Heather and Jed’s neighborhood. 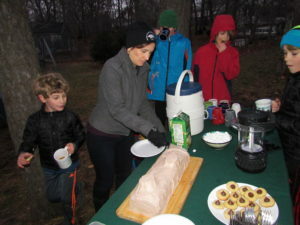 Heather read a poem that was written for Revels called The Shortest Day by Susan Cooper and Sam lit the solstice fire as we all yelled out, “Welcome Yule.” Heather made her traditional chocolate yule log and we had cookies made by boys and myself and some from the neighbors. 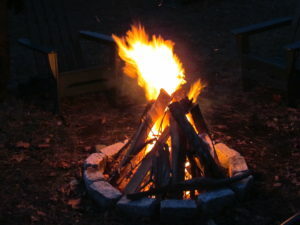 We also had hot mulled apple cider, egg nog, and hot chocolate for drinks and the fire to keep us warm. It was a delightful celebration. After our celebration and dinner, I headed to downtown Falmouth to attend a Christmas concert at St. Barnabus Episcopal Church with friends Jane and Bruce and Olivia and Terry. This year the concert was ‘A Skylark Christmas’ presented by an ensemble of world-class vocalists who call themselves Skylark. Tonight’s program featured excerpts from the works of German composer Hugo Distler’s Christmas cantata. The singing was superb. And afterwards, we all went to Liam Maguire’s, a downtown Irish pub, for drinks and conversation. It was a lovely day and evening . . . until I got home and discovered that I have yet another technical difficulty. These days when I write my log, I turn on the TV to catch up on the day’s news. Yesterday I thought I had rectified my cable issues, but tonight they are back. I have new equipment that worked great yesterday and this morning, but tonight when I got home, there once again was no internet and no TV. I rolled back the rug, moved the Christmas tree, and tried to reboot the system with no success. This time when I talked to Comcast, they did more trouble shooting and decided that I am having signal issues. A technician cannot come until Thursday. It’s not the end of the world, but it makes me very sad and frustrated to keep having these issues. I just want things to work right without so many hassles. And it doesn’t help that I had to roll back the living room rug and pull the Christmas tree out of the corner in order to get access to the cable equipment. Yesterday after I got the new cable box and everything was working just fine, I wrapped the Christmas presents and put them under the tree. Tonight I had to move all of that and will have to leave it that way until Thursday. What an ugly ending to such a delightful day.